F. W. Seagrist Jr. Co. 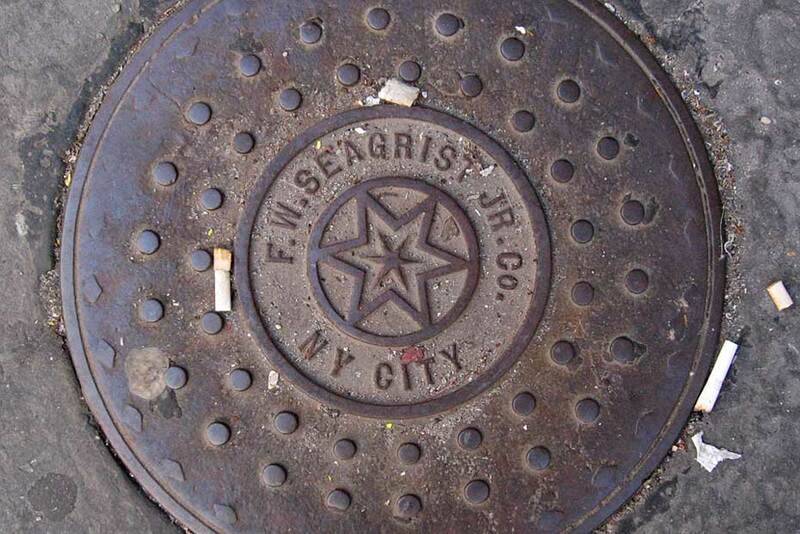 The F. W. Seagrist Jr. Co. was founded in the 1870s and stayed in business in New York City until the early 1920s. Their location was Ave. B near 18th St. in an industrial area of the city now occupied by the housing complex called Stuyvesant Town. Their address from 1886 to 1913 was 302-308 Ave. B, and then from 1914 to 1922/23 533 E. 18th St. Initially they were suppliers of building materials, apparently both new and used. Over time they became specialists in building demolition, and in the early 1920s were succeeded by the Seagrist House Wrecking Corp. These ads from 1892 and 1915 stress the building material side of the business. The founder of F. W. Seagrist was Francis William Seagrist, Jr. (1850-1908). Several notices appeared on Seagrist's death in 1908, including this from the New York Times, 13 Feb. 1908, "Francis William Seagrist, Jr., who died after a brief illness yesterday at 17 Livingston Place, was a pioneer in the field of demolishing buildings. For thirty years he conducted the business at Avenue B and Eighteenth Street. He was a veteran of the Seventh Regiment and a member of the Knights of Honor and the Royal Arcanum. He also belonged to the Building Trades Club and the Mechanics' and Traders' Exchange. His widow and a son survive." Another notice was this one in the Real Estate Record and Builders' Guide, 15 Feb. 1908, "One of the men longest in the business of house wrecking and dealing in second-hand material, Mr. Francis W. Seagrist, Jr., died in his residence, 17 Livingston pl. on Feb. 12, after a brief illness. He was a veteran of the Seventh Regiment and also belonged to the Building Trades Club and the Mechanics' and Traders' Institute. His widow and three sons survive. The firm of F. W. Seagrist, Jr., Co., is one of the largest in the trade, and the late Mr. Seagrist was widely known and esteemed. The business will be continued as before Mr. Seagrist's demise, at 18th st and Av B." A notice in the Times on 16 Feb. 1908 regarding Seagrist's will mentions, "The late Mr. Seagrist was in the building material trade, and came into prominence some years ago through giving Police Captain Stephenson a basket of peaches as a bribe." The three sons of F. W. Seagrist who continued his business were Clarence Edgar Seagrist (1873-1948), Royal Harry Seagrist (1883-1936) and Nicholas Mars Seagrist (1893-1962). Clarence and Nicholas Seagrist were prominent in a successor company called the Seagrist Co. Inc., located at Brook Ave. and 166th St. in the Bronx. F. W. Seagrist Jr. Co. was also succeeded by the Seagrist House Wrecking Corp., headed by Frederick Witz (1865-1929). Witz was treasurer of F. W. Seagrist in 1915, and became president of Seagrist House Wrecking a year later. A trademark dispute between Clarence Seagrist and Frederick Witz was described in The Trade-mark Reporter, Volume Seven, 1917, "In 1880 F. W. Seagrist, Jr., organized and carried on under his own individual name the business of house wrecking. In 1899 he incorporated the business under the name of the F. W. Seagrist, Jr., Company, and continued as the chief factor in the corporation until his death in February, 1908. His place in the corporation was then taken by his oldest son, Clarence W. Seagrist, and the business continued until January, 1915. The business of the corporation had been carried on at the same location for upwards of thirty-five years. The defendant Clarence E. Seagrist is the president of the F. W. Seagrist, Jr., Co., and on the 12th day of June, 1916, the defendant F. W. Seagrist, Jr., Co., was duly granted a discharge in bankruptcy. The defendant corporation desires to resume business. The other officers of the defendant, besides Clarence E. Seagrist, president, are Ida M. Seagrist, widow of F. W. Seagrist, Jr., as vice-president, and Nicholas M. Seagrist, another son of Frederick W. Seagrist, Jr., as treasurer. There are a number of other stockholders in addition to the officers. The defendant Clarence E. Seagrist entered the employ of his father, F. W. Seagrist, Jr., in 1888, and has ever since been connected with the business, becoming a partner in 1895 and later being connected with the corporation, becoming its president, as noted above, in due course after the death of his father. ..."
All of the Seagrist companies seem to have closed by the late 1920s. Another Seagrist coal chute cover is found on Villa Avenue, the Bronx. The inscription reads, "F. W. Seagrist Jr. Co. 18th St. & Ave. B. N. Y."